Take advantage of the best educational opportunities available to the home building industry. Education is at the core of every profession. Achieve the highest level of professionalism, participation, leadership and business profitability within the dynamic building environment using a variety of educational resources offered through the HBA. Visit the Online Calendar for Upcoming Education Classes and Seminars. View the list of Classes and a course description. Visit NAHB Education webpage to learn about the ways you can gain the competitive edge needed in our thriving industry. View the NAHB Designation list to learn what courses and designations are best for you. 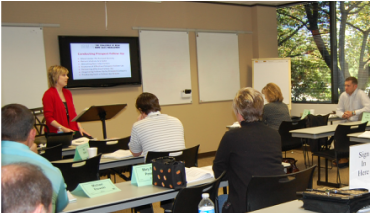 Learn about upcoming NCHBA classes that are part of the NC Builder Institute. The HBA provides annual scholarships to students, who are children or grandchildren of active HBA of Raleigh-Wake County members, and who plan to attend full-time, a four year public college or university in North Carolina.